One of the highlights of our past two summers in Vienna has been the music film festival. A large screen is placed in front of the Rathaus, and hundreds of chairs and bleachers are put out so people can enjoy the music films. The music films range from classical to jazz, and there are some ballet performances and modern rock and roll thrown in for good measure. Of course, this is not what interests me. 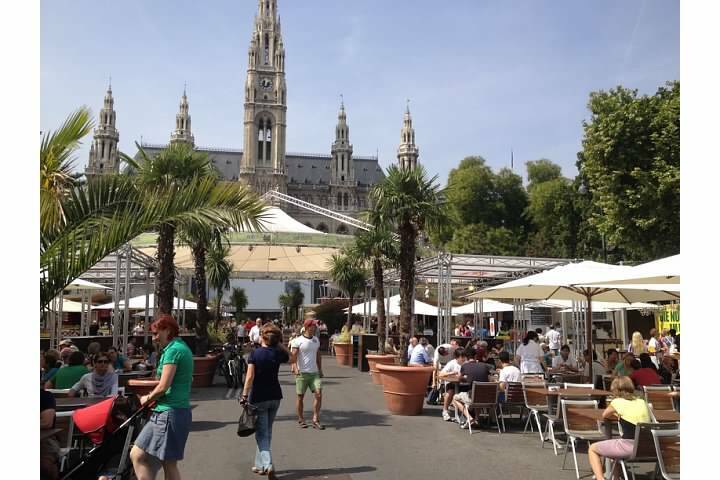 About 20 food stands are set up along the path leading from the ring road to the front of the Rathaus, representing culinary delights from both Austria and as far afield as Australia. Each booth has, in addition to its ethnic food, a couple signature cocktails on offer. There are also a couple ice cream stands and coffee stands interspersed with the food stands. 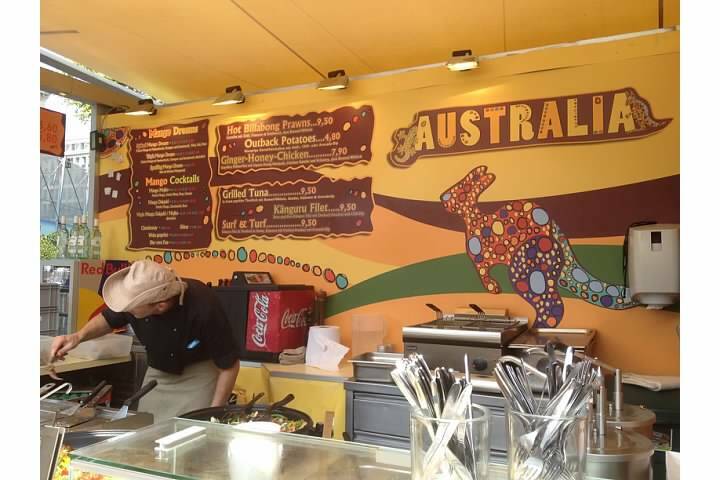 The first time we visited the food… er, film festival this year, we went to the Australia booth. I had the grilled tuna and my new favorite drink, Mango Dream (mango juice and champagne). My husband got the *sniff, sniff* kangaroo steaks, which came with perfectly roasted fries and dipping sauces. I’m not going to lie — the kangaroo was pretty tasty and I enjoyed it more than my fish. This afternoon we visited the stand operated by Gelbmanns Gaststube. 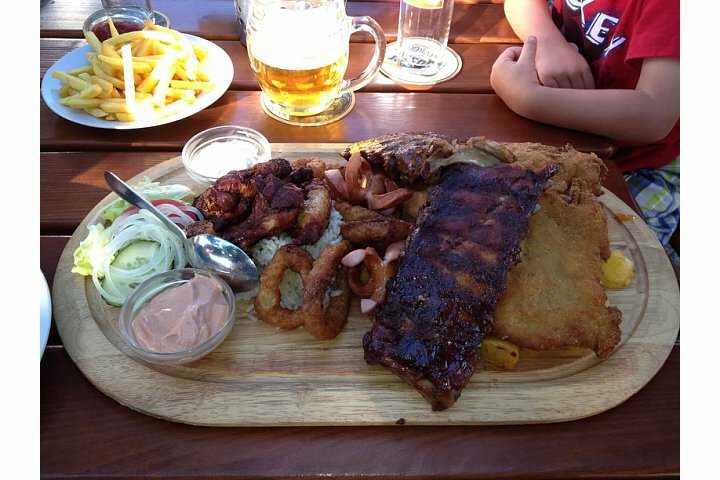 I had the above-pictured meal, along with an erdbeere bowle (strawberry punch). 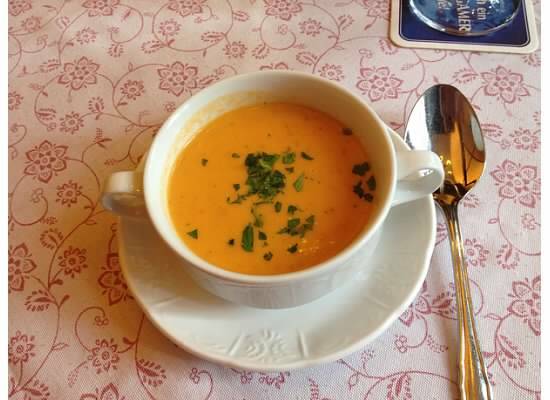 Gröstl is roasted potatoes, onions, tri-color peppers, and cubes of bacon seasoned with caraway seeds, with slices of tafelspitz (boiled beef) mixed it. 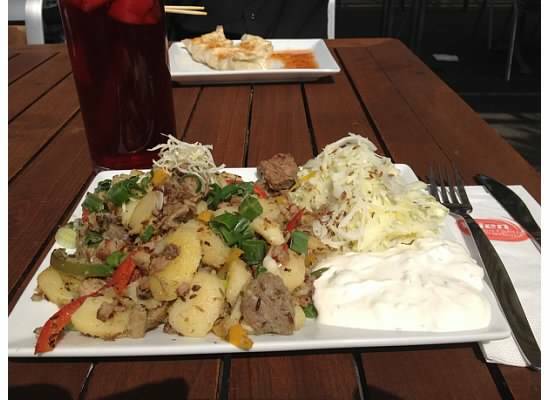 It was served with a generous portion of krautsalat and a sour cream sauce, and garnished with kren. My husband and I both enjoyed this dish and I plan to find a recipe to recreate it. Sadly the film festival ends 1 September, but I have the consolation that it’ll be back next summer. My parents are visiting and as they’ve never been to Vienna before, we started the week with a bus tour. 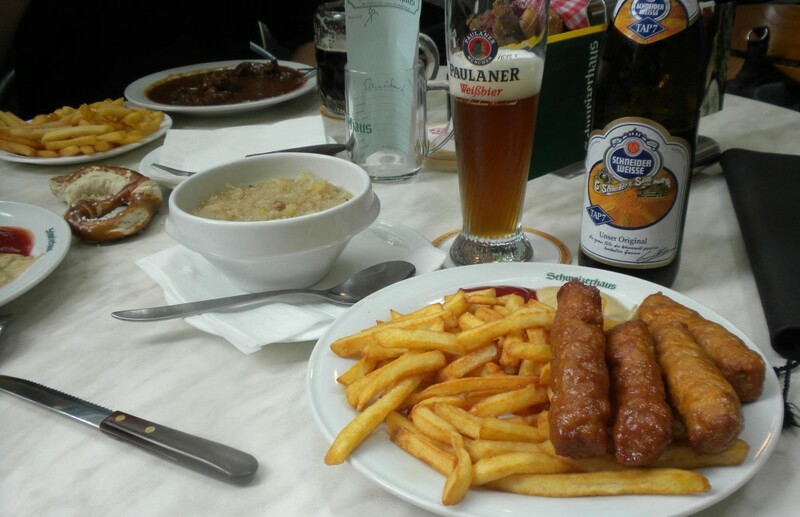 Staying with the “tourist” theme, we headed to Wienerwald restaurant in the 1st district for lunch. It’s one of those restaurants where the menus are in multiple languages and have pictures. 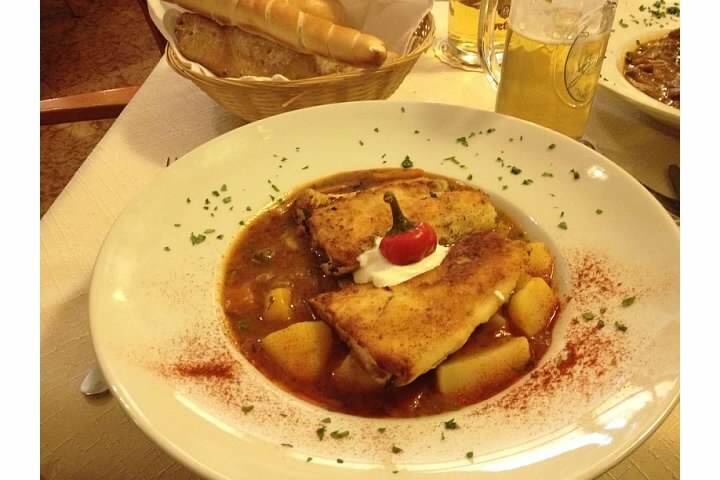 While it isn’t high cuisine, it does serve traditional Viennese dishes. Oh, and my kids love it. I don’t know what compelled me to order such a heavy dish as we were sitting in an un-air conditioned restaurant in 97-degree heat, but oddly enough I am glad I did as it was pretty tasty. 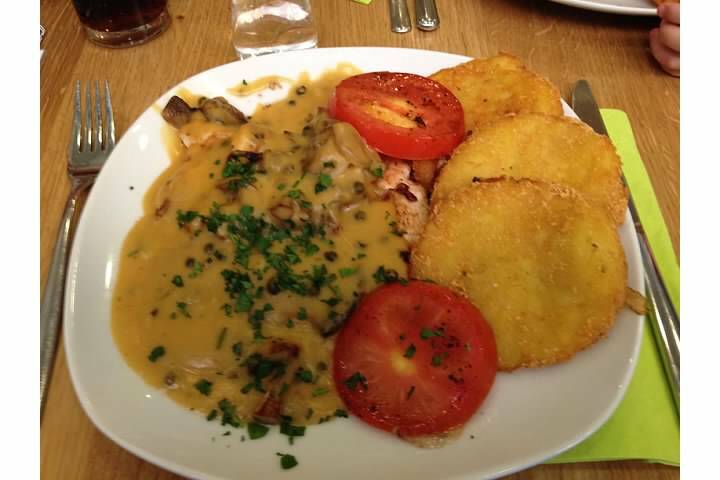 The dish is a chicken filet covered with pepper cream sauce, mushrooms, and fried onions, and served with tomatoes and rösti. Rösti are fried potato pancakes, and I must admit that I did not know what differentiated them from kartoffelpuffer (see my recipe for those here). I did some Googling and learned that rösti are Swiss and are never made with eggs or flour, as kartoffelpuffer are. Hmmm… I could not taste an appreciable difference between rösti and kartoffelpuffer, but that may be because the sauce was so overpowering. I plan to recreate this dish at home in the near future, maybe even with rösti instead of kartoffelpuffer if I’m feeling really industrious. Stay tuned.